A few weeks ago I pointed at a Bicycling magazine article about the stats of pro cyclists vs. the mere mortal. 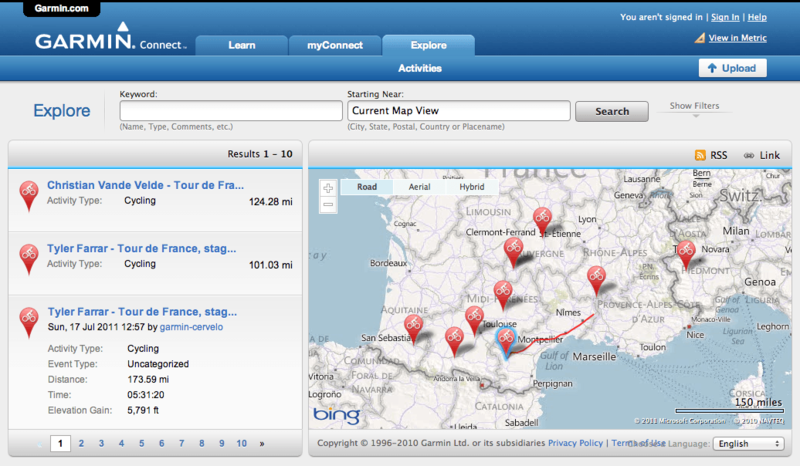 Garmin’s just posted a bunch of real-world data from the Tour de France on the Garmin Connect site from Garmin Cervelo riders.. It’s pretty amazing stuff. For example, on stage 18 (Pinerolo to Galibier) Christian Vande Velde climbed 16,627 ft at at average speed of 20.1 mph and a max speed of 53.5. He burned 5616 calories and put out an average power of 276 watts and peak of 821 watts. I’m actually shaking my head in disbelief as I write this—that’s an incredible power output.